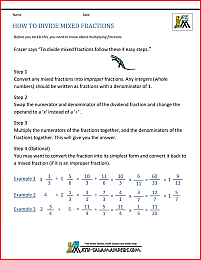 Welcome to the Math Salamanders 6th Grade Math Worksheets hub page. 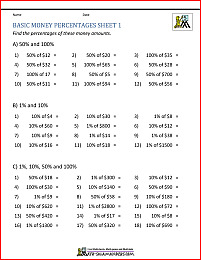 Here you will find a wide range of free printable 6th Grade Math Worksheets, for your child to enjoy. Come and take a look at our adding subtracting fractions page, or our 6th grade math games page. Looking for some help with algebra? 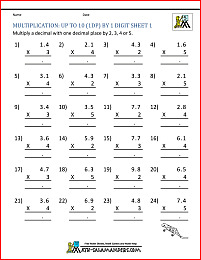 We have some basic algebra worksheets too. Hopefully you will find something here to meet your child's math requirements! 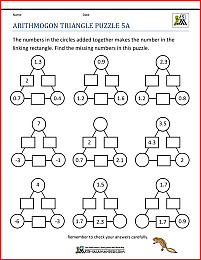 On this page you will find link to our range of math worksheets for 6th grade. 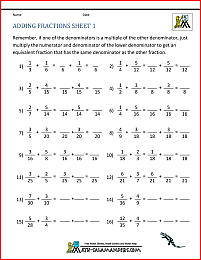 Here you will find a range of Free Printable 6th Grade Number Worksheets. know and be able to use the PEMDAS (or PEDMAS) rule. The sheets in this section involve ordering lists of decimals to 3 decimal places. 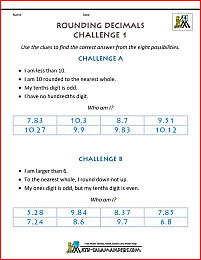 There are sheets with decimals up to 10, and also sheets with numbers from -10 to 10. Each sheet is carefully graded and comes with an answer sheet provided. 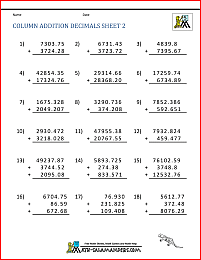 The sheets in this section involve rounding decimals to 1 or 2 decimal places. 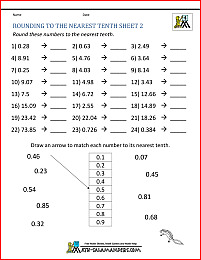 There are also some rounding challenges which are great for extending more able mathematicians. Each sheets is carefully graded with the easier sheets containing useful support. The sheets in this section involve filling in the missing numbers in sequences. They will help your child to count on and back by multiples of 0.1.
count on and back into negative numbers. The sheets here will give your child greater confidence adding and subtracting decimals mentally. 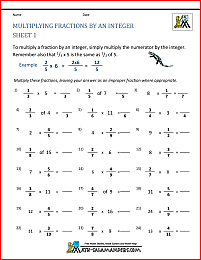 Here you will find a range of Free Fifth Grade Addition Worksheets. 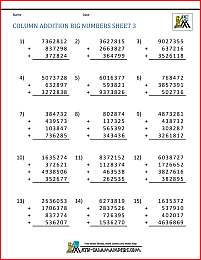 The following worksheets involve using addition at a 5th grade level. add a columns of multi-digit numbers, including decimals. 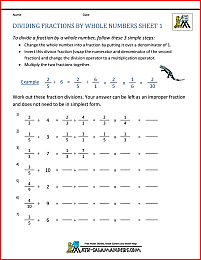 Here you will find a range of Free Printable 5th Grade Division Worksheets. 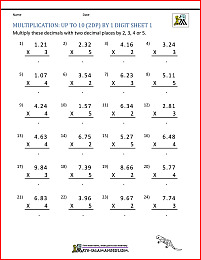 The following worksheets involve using the 5th Grade Math skills of dividing, and solving division problems. express any division with a remainder in the form of a mixed number (a number with a fraction part). All the free Math sheets in this section are informed by the Elementary Math Benchmarks for 5th Grade. 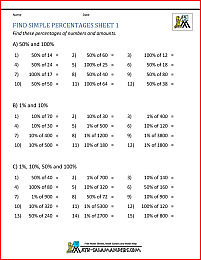 Take a look at our percentage worksheets for finding the percentage of a number or money amount. 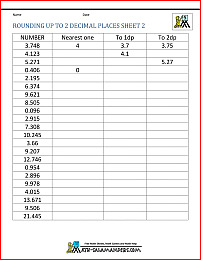 We have a range of percentage sheets from quite a basic level to much harder. 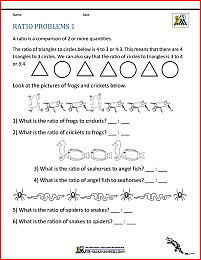 Here you will find a range of free printable 5th Grade Geometry Worksheets. At a Fifth Grade level, children learn to measure angles in degrees. They know about different properties of angles, such as right angles and angles in a straight line. They are able to construct and use nets, and know the five regular 'Platonic' solids. They can also calculate the area of shapes made out of triangles, and they can interpret and plot points on the co-ordinate plane. know how to calculate the area of a range of quadrilaterals. write and plot coordinates in the first quadrant. All the sheets in this section support elementary math benchmarks. Find links to our 4th grade Statistics worksheets below. find a missing data point when the mean is given. find the median of a set of data. 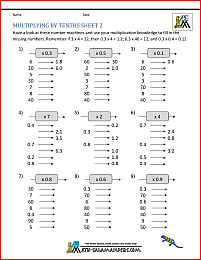 All the free 5th Grade Math Worksheets in this section follow the Elementary Math Benchmarks for Grade 5. Come to our friendly 5th grade math help page!